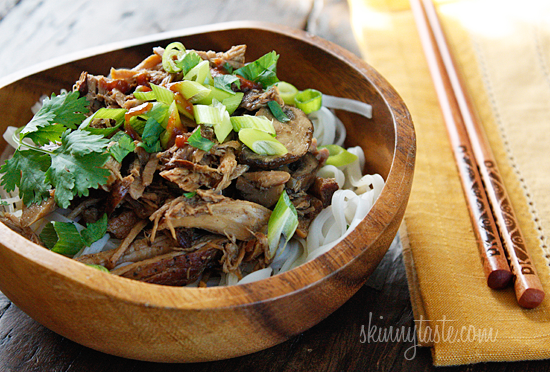 Crock Pot Asian Pork with Mushrooms ~ Rachel | Losing It! Have you all discovered the blog Skinnytaste yet? Gina hasn’t let me down yet with her recipes. The latest recipe that I tried is a definite keeper. Dave loved it so much that he was enthusiastic about eating leftovers. We had this for dinner one night…and he made tacos out of it the next day for lunch…and we finished it up at dinner that next day. I would say that’s a pretty good endorsement! Rather than retype the entire recipe, I’ll just repost Gina’s picture with this link to her recipe. You will not be disappointed, I promise! Dang, not a fan of mushrooms, but this looks delicious! I love Gina’s recipes too – I like that they are normal ingredients with actual food, not like Hungry Girl – do you like her? She just rubs me the wrong way for some reason.